Rev. Larry Lisowski, is a native of Chicago and a priest of the Archdiocese of Chicago. He was ordained on May 19,1984 by Cardinal Joseph Bernardin to serve the people of God. Fr. Larry loves being a parish priest and has been blessed with a number assignments that have allowed him to tend to the spiritual needs of those seeking to journey together in the Catholic faith, and share in a lifelong relationship with Christ. In July of 2014, Fr. Larry answered the call to serve the two parish communities of Immaculate Conception and St. Joseph. He enjoys calling people forward to share their gifts and talents to help enhance to life of the parishes. He is committed to the welcoming spirit that is present in our worship, prayer, service and hospitality. For fun, Fr. Larry enjoys zipping around the city on a scooter or bicycle, paddling down a river in a kayak, and listening to the Prairie Home Companion Show on Saturday nights. Fr. McBrady is a senior priest of the Archdiocese of Chicago. He was ordained in 1971 and has served in various parish ministries, as well as the Vicar for Priests. He currently provides spiritual direction, retreats and other adult faith formation opportunities. We are blessed to have such an excellent preacher preside at our Masses and various liturgies offered at Immaculate Conception and St. Joseph Parishes. Mark joined the ICSJ Parish staff in 2007 as a part-time assistant to the Business Manager, with duties ranging from generating end-of-year contribution statements to operating and maintaining Give Central – the Parish's online offertory and donation system – and Parish Soft, our church management software. In 2014, Mark became the Parish Business Manager. In addition to his previous duties, he now provides all accounting, financial, and operational services for the Parish and School. Mark grew up in Florida, and graduated from University of Central Florida with a degree in Finance. He loves to fish, play soccer, and spend time with his family. Kim joined the ICSJ Parish staff as Director of Religious Education in 2016. 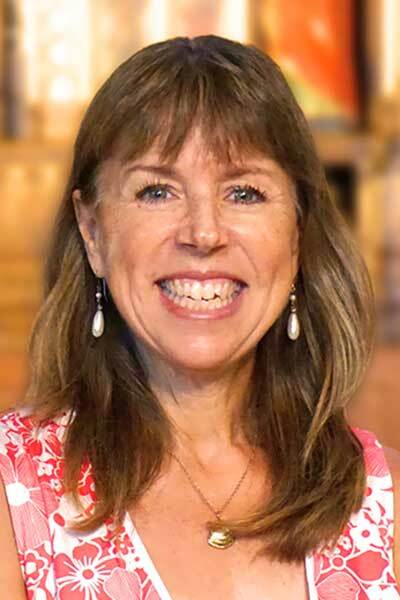 As her mission is to bring others closer to God everyday, she is responsible for the on-going faith formation of all parishioners, from children to adults. This includes sacramental preparation, children’s religious education, adult formation, and catechesis for those considering becoming Catholic. Kim received her third Master’s degree in Pastoral Studies from Loyola University. Before answering God’s call to become a Lay Ecclesial Minister, she worked as an elementary school teacher and a theatrical costume designer. In gratitude for so many blessings, in the summer of 2016 Kim traveled to Spain to walk the Camino de Santiago, a pilgrimage of 500 miles. Kate has been the Director of Music for ICSJ Parish since 2015. Kate's formal education includes an undergraduate degree in Music Education from Saint Mary's College, Notre Dame, and a Masters Degree in Performance from The Boston Conservatory of Music. Kate continued her studies at both The New England Conservatory of Music and The Longy School before moving to California, where she worked for ten years in music education and performance. Kate was a Adjunct Professor of voice and theatre at Santa Clara University, and has been a vocal coach and music director for the Bay Area's biggest stages. Kate is eager to make Chicago her home and become fully immersed in the vibrant ICSJ Parish community. Katie Sullivan grew up in Flossmoor, Illinois and attended Infant Jesus of Prague elementary school. After attending Homewood-Flossmoor High School she attended Bradley University and received a B.S. in Early Childhood Education. Katie began her teaching career at St. Mark School in Humboldt Park with the opportunity to open their first Prekindergarten classroom. Additionally, she taught both Second and Fourth grades at St. Mark. While teaching, Katie received her M.A. in Educational Administration from Dominican University as a student in the Archdiocesan Leadership Program. Katie has served as a principal in the Archdiocese of Chicago since 1998. Prior to joining the Immaculate Conception community and reopening the school in 2002, she was a principal at a small Catholic school, Mater Christi, in North Riverside. Katie considers her collaboration and partnership with two outstanding Pastors and an amazing Co-Principal one of the greatest blessings in her career at ICSJ School. Katie lives in the Andersonville neighborhood with her husband and two children. Ms. Hill began her career in education teaching English and Spanish at St. Rita High School on the south side of Chicago. After teaching at St. Rita for two years, Ms. Hill accepted a teaching and administrative position at Fenwick High School in Oak Park, IL. She worked at Fenwick for ten years and in her tenure served as teacher, assistant admission director, admission director and lastly, assistant principal. When the opportunity to open a new school and create a new curriculum surfaced at ICSJ School, Ms. Hill knew that this type of opportunity would never cross her career path again, so she took a leap of faith and partnered with Ms. Katie Sullivan to grow ICSJ School. This has been an exciting and rewarding journey. In addition to devoting her entire career to Catholic education, Ms. Hill is also a product of Catholic education. She attended St. Symphorosa School on Chicago's southwest side, then Nazareth Academy in LaGrange, IL for high school and earned a Bachelor of Arts Degree from Bradley University and a Master's degree in Education from Loyola University. Ms. Hill is married and is the proud mother of three children, who all attend ICSJ School. If you need any work done 60 floors up, Colm’s your guy. After relocating to Chicago in 1999 from County Wexford, Ireland, Colm began working for McHugh Construction and soon he found himself putting up steel for some of the city’s tallest new skyscrapers. With the knowledge he gained there, he went on to earn a degree in Stationary Engineering, becoming an expert in all things structural and mechanical relating to buildings. In 2010, Colm brought his skills to ICSJ where, along with his staff, he keeps the Parish facilities – which means two churches and two schools! – in working order. A father of two, Colm enjoys golfing and watching the Blackhawks in his spare time, as well as helping with the maintenance of his father-in-law’s restaurants. Angela joined the ICSJ staff in February 2015, and in her role as Parish Coordinator she oversees facility scheduling and coordination, maintains sacramental records, and provides hospitality and assistance to Parish Office visitors and callers. Angela grew up in Houston, Texas and graduated from Texas Tech University with a B.S. in Biology. Angela enjoys spending time with her family and is very active at her children’s school where she helped establish the Wellness and Sustainability Program and provides student education and care with the garden, compost system, and the school chickens and bees. Clair joined ICSJ Parish in August 2015. In her role as Parish Coordinator, she oversees facility scheduling and coordination, maintains sacramental records, and provides hospitality and assistance to Parish Office visitors and callers. Clair was born and raised in Waukesha, Wisconsin. She graduated from University of Illinois at Chicago in 2012 with a degree in Communications and a minor in history. At UIC, she was a competitive swimmer, where she served as team captain her senior season. Following graduation Clair accepted a position with the Chicago Wolfpack Aquatic Club where she coaches competitive swimming for ages 9-10 and 13-15 year olds. Allie joined the ICSJ Parish staff in 2018, and in her role as Events Coordinator. Whatever you think) Allie grew up in Rockford, IL amidst a big Sicilian family. She graduated from Mount Mary University in 2012 with a Masters in Occupational Therapy and Rockford University in 2015 with a Masters in Business Administration. Allie keeps busy by working as an occupational therapist at two hospitals here in the city, running a nonprofit organization, visiting patients with her therapy dog, Chloe, and leading the young adult ministry here at the parish. Madison has her BA from Saint Mary's College of California (#GoGaels) in Theology & Religious Studies as well as English. She is currently pursuing her MA at The University of Chicago's Divinity School where she studies Moral Theology and Ethics, specifically around disability. She's got plenty of youth ministry (and a little bit of middle school teaching) experience under her belt! Madison loves reading, writing, boxing, and tea. But she MOST loves talking to people about how Catholic Social Teaching shows us exactly how to make the world a better place for everyone in it. Sherrine (please call her Sam!) has been a part of the Immaculate Conception and St. Joseph Parish staff since 2001. Prior to that, she worked in the I.T. department at Salvation Army for 26 years. Sam is a real people person; she’s the eldest of 8 children, has 19 nieces and nephews, and loves working with all the parishioners, school children and staff members that make up the IC-SJ family. Outside of her work for ICSJ, Sam devotes herself to non-profits – work which she always finds fulfilling regardless of her duties – and caring for her dear mother. The most important thing of all to Sam is “giving back” for the many blessings she’s received.